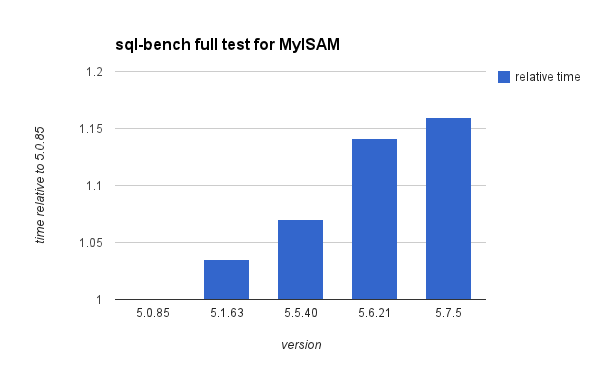 MySQL 5.7 does much better on benchmarks with high-concurrency. It might do worse on benchmarks with low-concurrency. I am not surprised as this has been true across many releases. The question is whether anything can be done to reverse it. When testing 5.6 I filed bugs 68825 and 69236 for this problem. Maybe it is time for new bug reports. I measure the following from sysbench for InnoDB but must add the disclaimer that I have yet to explain these results and I am wary of unexplained benchmark results. And also note that these overheads are for the sql-bench workload. Your workload might have a smaller overhead. By the same token, if you have less overhead when running TPC-D queries that doesn't mean there isn't a performance regression for short-running queries at low concurrency. I previously compared MySQL 5.6 to older releases to document performance regressions for single-threaded workloads. This is an important workload even if high-concurrency benchmarks get all of the PR. Database reload and replication apply are cases where low-concurrency performance matters a lot. Others have made a similar case for the importance (Percona, Yoshinori). 5.6.21-ps2, 5.7.5-ps2 - MySQL with PS enabled and performance_schema_instrument="wait/io/%"
I think it is odd to publish benchmark results with the PS disabled. It should be enabled for benchmarks with basic instruments configured (rows changed/read/inserted/deleted, IO requests and time per table, similar metrics per user) because the PS does two things -- per user/table monitoring which is always enabled and performance debugging for things like mutex contention which isn't always enabled. There is one time when benchmarks can be run with PS disabled, and that is when searching for the PS overhead. This result is from the Wisconsin benchmark included in sql-bench for InnoDB. This shows a gradual increase in response time and 5.7.5 is about 10% slower than 5.0.85. The overhead from the performance schema for this workload is small which matches what I have seen before. The PS overhead can be significant for short running queries but is small for others. 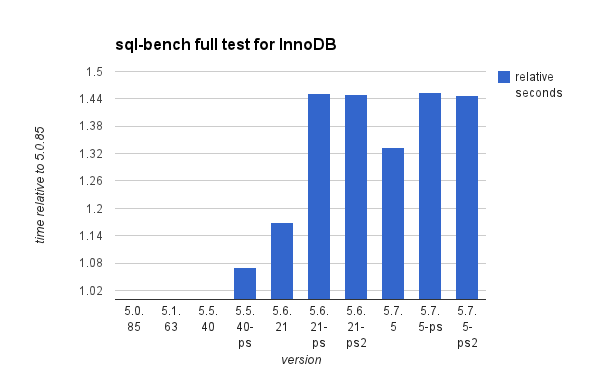 This is the result from a full run of sql-bench for all of the MySQL versions with InnoDB. The create test is much slower starting in 5.6.21 and most of the overhead is in the create_key+drop subtest. The insert, select and transaction tests get slower gradually from 5.0 to 5.7. Only one test, alter table, got faster from 5.0 to 5.7. There is also a significant penalty (25% in 5.6, 10% in 5.7) from enabling the performance schema but no penalty from using performance_schema_instrument="wait/io/%" after enabling the PS. This shows the total time relative to the time in seconds for MySQL 5.0.85. Thus the relative time is about 1 for 5.0.85, 5.1.63 and 5.5.40. This has data for all of the test types excluding wisconsin that takes 5 to 7 seconds. I repeated the test for MyISAM with the PS disabled. There continues to be a regression from 5.0.85 to 5.7.5 but it is smaller than the one for InnoDB -- 1.33X versus 1.16X. So the regression isn't limited to InnoDB. Likely suspects are the parser, optimizer and performance schema (which doesn't narrow the problem much). ./run-all-tests --server=mysql --host=127.0.0.1 --log --create-options="engine=innodb"
As result means that 5.0.85 is more indicatade for performance in microservices?